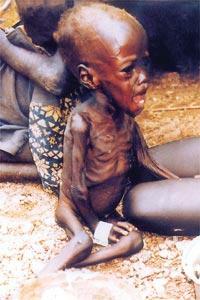 Famine and malnutrition plague Ethiopia`s population. Ethiopian Archbishop Abune Berhaneyesus D. Souraphiel is on a private visit in Malta until Tuesday to thank all those Maltese who have shown so much support and compassion to the people of Ethiopia. Mgr Souraphiel, who is Metropolitan Archbishop of the Ethiopian capital Addis Ababa and president of the Bishops' Conference of Ethiopia and Eritrea, will be received by President Guido de Marco at the Palace, Valletta, tomorrow monring. Archbishop Souraphiel, who hails from Eastern Ethiopia, has dedicated his life to helping his own people. His faith and dedication have never faltered, even after a spell in prison, and today he is still working tirelessly to help the poor and the needy, to give them not only their basic needs, but also an education and a sense of dignity. The Archbishop received his first education from the De La Salle Brothers and at the seminary. He then read theology in London and returned to his homeland to help his people. He worked in Western and Southern Ethiopia until the government which took over after a Communist-led military coup led by Colonel Mengistu Haile Mariam, which overthrew Emperor Haile Selassie in 1974, cut short his activities. When the Marxists came to power they banished all expatriate missionaries. Initially, they allowed local priests to carry on with their work, but very soon things changed drastically. The Communist government wanted to do away with religion and started a campaign to eradicate it. A period of great suffering for the Christian community followed under Colonel Mariam. The Archbishop was sent to jail, simply because he was a priest at the time. He spent a month in solitary confinement, in an extremely small room with only a tiny window very high up. "I was allowed out of my room only twice a day," he said. "I was very, very afraid. I spent my time pacing the room, feeling lonely. I prayed a lot and I had God for company. I could not even read my Bible. I could not say Mass. Bibles were confiscated, as were rosary beads. Church property was confiscated and to this day many places have not been given back. "I was afraid I would be killed. So many people were killed, simply for not being Marxists and opposing the then government. After a month I was transferred to another cell with other prisoners for company." His family knew where he was and so they pleaded for him and put pressure on the government to have him out of solitary confinement. After seven months, they got him released, saying they would teach him Marxist ways. He was banished from Southern Ethiopia, "and so I went to the Gregorian University in Rome, where I read social sciences," he said. When the communist regime collapsed in the Soviet Union, it also collapsed in Ethiopia. Religious were allowed to return. Mgr Souraphiel was appointed Apostolic Prefect in southern Ethiopia and he continued to work among and for the poor and the needy. There he met Fr George Grima, from the Gesù fil-Proxxmu missionary movement. Fr Grima was helping the lepers in the area. He is still working in Ethiopia, helping the lepers and the poor, often starting projects from scratch. Fr Grima is currently involved in programmes of water management, food and health. His movement is giving people stability in life, helping them generate income and to manage their own lives. The society gives people material things, like cows, and also education and knowhow. Mgr Souraphiel was then appointed Metropolitan Archbishop of Addis Ababa. As president of the Bishops' Conference of Ethiopia and Eritrea, he also has a mediating role. Relations between the two countries (which at one time were united, but Eritrea seceded in 1993) are strained and the bishops' assembly has to meet outside Ethiopia or Eritrea. The Archbishop has not forgotten the poverty that plagues his country. Drought and famine are pervasive, people do not have the technical know-how to survive and are still reliant on subsistence farming. "The country is very vulnerable," he said. "We are not only appealing for humanitarian aid; we also want to find long-term solutions for the country, for example integrated development. "The government is trying to help, but it is also poor," he noted. The devastation caused by the war between Ethiopia and Eritrea and civil strife combined with the recurring problems of drought and famine leave Ethiopia in a dangerous situation. Poverty remains on the increase. "Education is essential," the Archbishop said. "People need to learn how to make use of the resources. I work with the poor and the forgotten, but they are there; they need the help," he said. Another major challenge Ethiopia is facing is HIV, which is also on the increase and has reached dangerous levels. "There is no awareness," the Archbishop said. "Clinics and hospitals are a death sentence, with needles being used on multiple patients. The Sisters of Mother Theresa have a home for HIV-infected children and other organisations are also helping, but we need to teach people about the risks; we need to correct misconceptions." Both Fr Grima and the Archbishop spend a lot of time with outcasts. "In Modiyo, the people are all outcasts. When they go to the Bonga to grind their seeds, they are turned away," Fr Grima said. "So we have given them a mill so that they can survive. Mother Theresa once descriped Ethiopia as a continuous cavalry, and this is what we face." Gesù fil-Proxxmu has also recruited volunteers from Malta. A significant number of Maltese spend months in Ethiopia helping the poor, for example the Living Water Group and the Reaching Out Group. "The Maltese have adopted part of Ethiopia," Fr Grima said. "The Ethiopians look to us with hope." The Archbishop noted that people expect a lot from the Catholic Church, even though they are not the dominant religion in the country. "My dream is to have a Catholic University in Ethiopia, where people from all faiths and walks of life can get an education and learn good leadership." There is much more work to be done in Ethiopia, but every effort counts and yields positive results. "I would like to give my thanks to the people of Malta for showing so much generosity and compassion to my country. Thank you, we look to you with hope," Archbishop Souraphiel said.